This is my first workbook that is not specifically aimed at mums or parents, children or teachers although having said that, I am expecting it to have more appeal to women than to men. 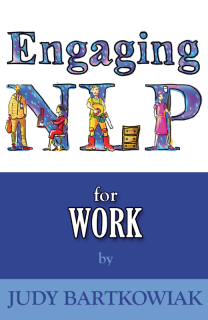 It is for all of you who want a quick and easy guide to how you can use NLP in the workplace. There are lots of books on this subject and I can certainly recommend Sue Knight’s book NLP at Work which I constantly refer to myself as an NLP ‘bible’ especially as I trained with Sue. However, when I was working in companies as a mum I was desperately trying to juggle family and work so tackling a large book at night or in the evening after a busy day at work just wasn’t an option. This book is essentially a workbook which straight away separates it from most of the others. I want you to get ‘stuck in’ and involved. 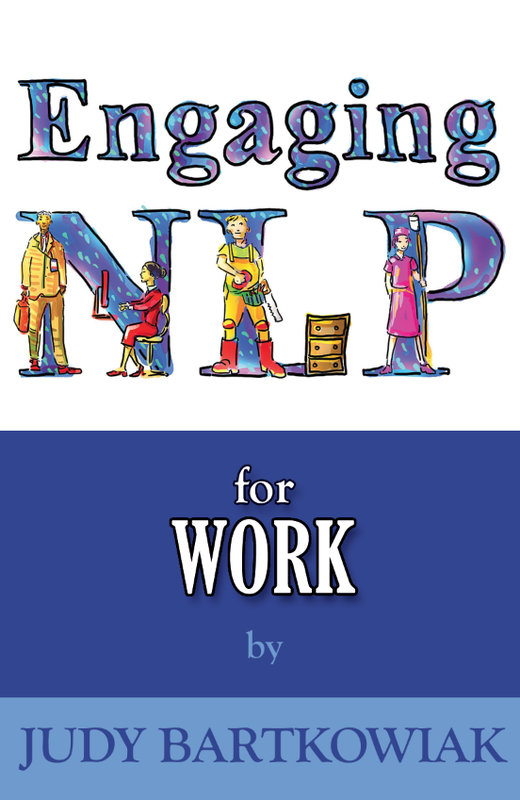 That’s why it’s called ‘Engaging NLP’ because it requires you to engage with it to get maximum benefit from it. As you will see from ‘About the Author’ at the beginning, I have worked in large corporates like ICI, Kodak and Mars in a Marketing/Market Research capacity. My last interim role was a Global Insight one so I have had quite a bit of International experience. I have also run a nursery school, worked freelance, run a Bed and Breakfast, taught English as a foreign language, worked in a Market Research Agency and run my own agency as a Managing Director. I have four children and my husband is ‘old school’ so I have had my fair share of challenges which I have had to face myself. In business environments today we work with colleagues from different cultures and continents who have different life experiences, beliefs and values so you may be pleased to know that the NLP language preferences apply to all cultures and languages. There are three language preferences; Visual, Auditory and Kinaesthetic. You can recognise someone who is visual quite easily regardless of which language they are speaking. They pay more attention than most to their appearance and may notice something you are wearing and comment on it. They like to present information visually using concept boards, mood boards and graphic presentations. 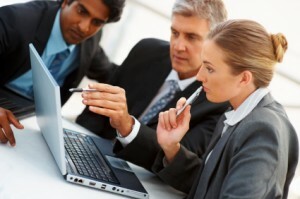 They probably work in a visual capacity where their skills are used such as Advertising, Graphic Design or Photography. Words they use paint images and pictures such as ‘Imagine the consumer….’, ‘Picture the pack design’, ‘What do you see?’, ‘I want to show you…’ To establish rapport with a visual person, replay their words back to them and use other similarly visual words. Show rather than tell and email rather than phone. By contrast an auditory person likes to converse with you. Phone calls are their preferred way of communicating if they can’t talk face to face as they don’t like emails and texts. They speak quite slowly taking trouble to find the right words and they will make the effort to learn your language because it is important to them to communicate clearly. They often have a lower tone to reflect the sincerity of what they say and they are good listeners because they want you to listen to them. Build rapport with an auditory colleague by using expressions like ‘I hear what you’re saying’, ‘Have I heard you right?’, ‘Listen to this’ ‘What does the consumer say on this?’, ‘Just give me the sound bites’. If they pick you up on a word you use, it isn’t a criticism; they just want to really understand what you are saying. A kinaesthetic colleague will be very empathetic, touch you on the arm, shake your hand and make good contact with you because they are more sensitive to atmosphere and getting on with people. Physically they are active and want to be doing rather than talking so they will want meetings to be short and action packed. They will talk about having ‘action points’, ‘getting a grasp of the facts’, ‘getting a feel for the consumer’, ‘jumping ahead of the competition’, ‘hitting targets’. Kinaesthetics want meetings to be workshops with plenty of interaction, activities and they want to take part. These colleagues will want to be on the shop floor, going to focus groups, meeting customers and generally making connections. Kinaesthetics want face to face meetings and don’t like emails and texts. The best way to make rapport is to match the preference of the person you are talking to. The book starts with an introduction to NLP and then goes on to tell you about the beliefs of excellence and how you can use them in your everyday working life. Chapter 1 is about networking and building relationships at work. How can you make the most of the interactions you have during the day and leave people with the feeling that they enjoy working with you? Chapter 2 is about feedback and reframing . You give and receive feedback all the time but do you make the most of it? Do you delete some of it, distort it or generalise? Chapter 3 is about goal setting. There is an intensive part of the workbook where you must write in your goal and then work on it. You will learn some NLP techniques such as anchoring and the Time Line. Chapter 4 you will be able to access your skills and examine some of your beliefs and values in order to boost your confidence. Chapter 5 you get the opportunity to make changes using the Logical Levels of Change. Chapter 6 is about modelling which is the way we acquire other people’s skills for ourselves. Chapter 7 as well as learning how to recognise it. Chapter 8 is about how we can use our language patterns to influence others as well as our body language.